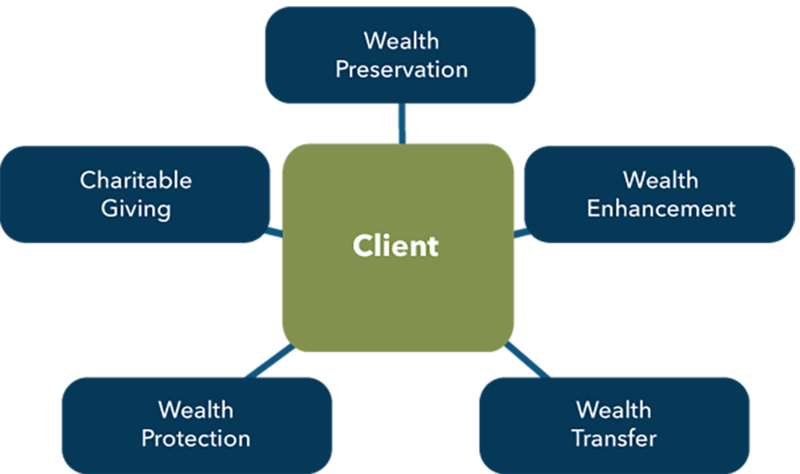 A wealth management process that employs a comprehensive approach to understanding your deepest needs, values and goals is essential to achieving all that is important to your family, as well as freeing you from many involved financial concerns. Research shows the financial concerns of successful families tend to fall into five major categories of planning. As you consider these five categories, chances are many of your major wealth concerns fit within this framework. Planning for wealth preservation is twofold. First, is simply not losing a substantial portion of accumulated wealth. Second, is selecting an investment approach most likely to achieve income or legacy goals, depending on personal needs, situations and risk preferences. Tax planning must mitigate negative tax effects from investment activities, and reduce or shelter tax on money earned or received from other sources—while preserving wealth. This encompasses all planning of charitable goals, such as arranging to donate a portion of your wealth in the most tax-effective way or in a way to make the greatest impact.